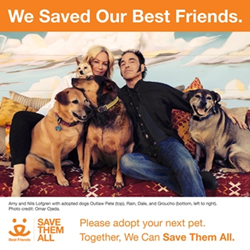 Nils Lofgren in photo campaign featuring celebrities posed with their personal rescued dogs and/or cats in support of Best Friends Animal Society's Save Them All® call to action. We remain huge fans -- and supporters -- of the great work Best Friends Animal Society does. Nils Lofgren, musician, songwriter, solo artist and beloved guitarist with Bruce Springsteen’s iconic The E Street Band, and his wife Amy, are supporting national animal welfare organization Best Friends Animal Society's efforts to end the killing of dogs and cats in our nation’s shelters. On April 10, Lofgren along with Springsteen and the other members of The E Street Band, will be formally inducted into the Rock & Roll Hall of Fame. The E Street Band, along with other inductees, will also perform during a simulcast of the event. Lofgren joins Danny Trejo, Carrie Ann Inaba, Denise Richards and other celebrities who will be featured in Best Friends’ photo campaign featuring celebrities posed with their personal rescued dogs and/or cats in support of the Save Them All® call to action. Save Them All is important to Lofgren because he and his wife, Amy, have “always been animal lovers and can't say enough about the love and companionship our dogs bring to our lives every day. Nils and Amy share their Arizona home with six rescued dogs, four of which are pictured in the Save Them All ad.